Day 01 : Upon your arrival in KATHMANDU(1000m/3280ft) & transfer to hotels. Introductory briefing about the program. Day 02 : City tour in Kathmandu valley which includes the visits to many historical and architectural monuments. Day 04 : Trek through mossy Rhododendron forests eventually leading to Chauki (2700m) . 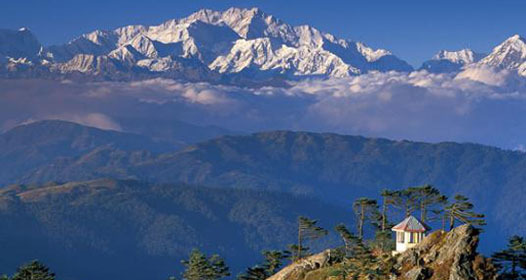 Day 05 : Receive your first views of various peaks including Kanchenjunga. Over night in Gupa Pokhari. Day 06 : Continue ascending early, through interesting forests. Camp the night by the river at Dovan. Day 07 : Most of the day you follow the river up the Tamur Valley through rocky fields up to Mitlung. Day 08 : Cross the river and continue up, the path narrows, you eventually reach the village of Chirwa. Day 09 : Trek up the Gunsa Khola valley. Riverside camp near the Tibetan village of Sakathum. Day 11 : Forests of bamboo, oak & rhododendron, waterfalls, pastures, and great views up to Kyapra. Day 12 : Descend steeply into the side of a ravine, trek along the river to yak pastures and up to Gunsa. Day 13 : Acclimatisation day – Gunsa. Trek to the lake at the Yamatari Glacier. Day 14 : Tackle the unstable slopes leading up to the Tibetan settlement of Kambachen (4,040m). Day 15 : Acclimatisation Day Kambachen. There are a number of day hikes to help acclimatise. Day 16 : The trail is rocky then crosses moraines. Camp at Lhonak, the views prevail from all directions. Day 20 : Today you trek along a trail that is difficult to distinguish. Camp at Tseram, a large flat meadow. Day 21 : Walk along the moraine of the Yalung glacier. The valley opens up, camp at Ramche (4,420m). Day 27 : Fly back to Biratnager and take a flight back to Kathmandu.